We have plenty of tricks and treats for you. Keep the kids extra warm with Woolly Halloween Hats and you can even get your dog involved with a Pumpkin Face Doggie T-shirt! Our Monster Maze Puzzles are a great alternative to chocolate and sweets, as are these pencils – split up the pack and hand one to each child that comes to your door. Our Kid’s costumes this year include ghosts, skeletons and zombies! Some of our costumes even come with a free bag! Make sure your children have a spooktacular evening! Our accessories include wigs, of various colours and styles, even ones with blood! Speaking of blood, you might want some to make your costume even scarier, so here’s some theatrical blood for you! If you fancy looking like a member of the walking dead, take a look at our special FX range, which also includes The Joker! Make sure to take a look through our men’s & women’s costumes which include Graveyard Bride, X-Ray and Red Riding Hood, who you could zombify to create Dead Riding Hood! We also have a range of Curves costumes, perfect for the fuller figure. As well as all that we have caution tape, bags of skulls and a best (or should it be worst?) dressed Halloween trophy! You’ll also see from our photos on Twitter that we have some discounted costumes ready to be purchased from our Harrogate store. 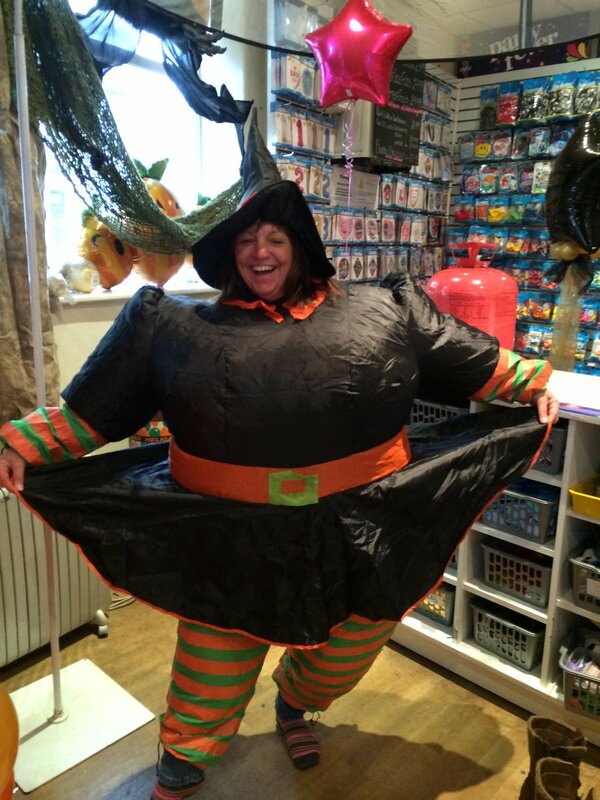 Fat witch/Bavarian serving wench/Chef/Sumo for only £9.99, perfect for All Hallow’s Eve! Have a super spooky Halloween!